The Irish Government spend around 1 billion Euros annually on defence. Ireland was a non-combatant in World War II and was never threatened during the Cold War despite not being a member of NATO. Where then is the justification for Scotland spending £3.5 billion annually on defence, as is currently apportioned by GERS? "Where then is the justification for Scotland spending £3.5 billion annually on defence, as is currently apportioned by GERS?" Drew - as per other comment it's £3bn - but of course we could spend less on defence, I've never questioned that. I merely observe that wasn't the prospectus offered before and that savings there as you suggest would not be close to sufficient to close the deficit gap. I'm not saying spending less on defence would close the deficit gap entirely but clearly spending £1 billion as opposed to £3 billion would be a step in the right direction. 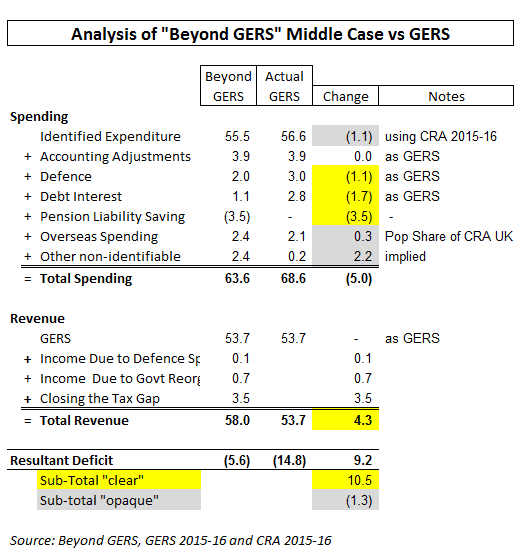 There are a whole range of actions required to get our spending back to sustainable levels but I was using defence as an example of where the UK Government spending in Scotland isn't as efficient as it should be. And I can't see the logic in you denouncing most of what was in the White paper as being not true, but then taking it as gospel truth that the Scottish Government could only save £0.6 billion on defence. As this blog shows, what the report from Common Weal shows is you'd have to do *all* of these things just to be back where we started - the only one of their proposals that we could definitely do is cut defence spending, I agree that's an option. Merely pointing out that's not an option that was presented before doesn't mean I'm taking the white paper as gospel. In essence you're picking a fight about £0.4bn (the difference between White Paper and Common Weal defence saving assumption) - I'm not taking part in that fight, I'm happy to accept it as feasible (albeit maybe not desirable to voters/defence sector employees). 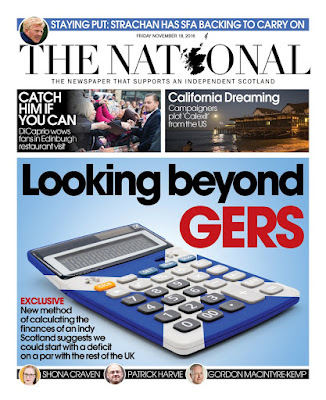 Now how about the other £8.6bn? I'm not picking a fight about anything. I just think some of your logic is inconsistent. I don't see how you can take the £0.6 saving at face value if all the other figures in the white paper are open to question. But we can't cut defence spending because we don't control it. Thankfully the UK Government is making a start by closing 8 out of the 22 bases here. In terms of the other £8.6 billion, as the setting of the Scottish budget and reserved spending is currently fixed by the UK Government and unless we get power devolved to set our own budget and spending limit, we can't make cuts to expenditure. So the only logical way we can reduce our deficit is to use the powers we get over income tax, ADP, Aggregates level, land & buildings tax and landfill tax. I would estimate to using the powers we will shortly get, we need to raise income tax by about 16p in the pound to raise £8 billion. If our politicians want to try and sell that to the public, the very best of luck to them! Very good, and tackled with saintly patience and forbearance to boot. The core section to a carefully-reading layman such as myself (its clarity assisted further by format & layout!) is the series of bullet points. And then the equally cogent conclusion. For that OTHER central issue - the relentless attempts by a number of repeat offenders (with by now fairly obvious motives) to demolish the whole edifice of economic analysis as a legitimate basis for modellings of impact & outcome, giving due respect to relevant variables and reasonable margins: one way I'd put it is that the only plotting such people appear to permit and have any understanding of is ... conspiracy. Rejecting all bases of realistic planning and any concept of probability, they appear to value obscurity, superstition and blind faith in an inspirational political pea-souper. PS: I'd tidy up small typos like McAlpine's name (courtesy stuff!) and "as an aside". but easy and probably pedantic for me to say! Excellent post, as was Neil's stylistically very different contribution with tallying conclusions. Apologies Kevin if I've not made myself clear. The report authors highlighted defence spending as an area where an independent Scotland could make potential savings, further to those suggested in the White paper. You highlighted this and reading through your sarcasm you seemed to suggest this wasn't a reasonable suggestion. My point is that I agree with the report authors on reducing defence spending, however I believe we could cut defence even further than £0.6 billion, even further than £1 billion. We should cut it by £2 billion, down from £3 billion to £1 billion. The UK Government has already committed to nearly 20% reduction in the defence estate in Scotland by 2030 which I think is a sensible approach and long over due. But I think they need to go much further. 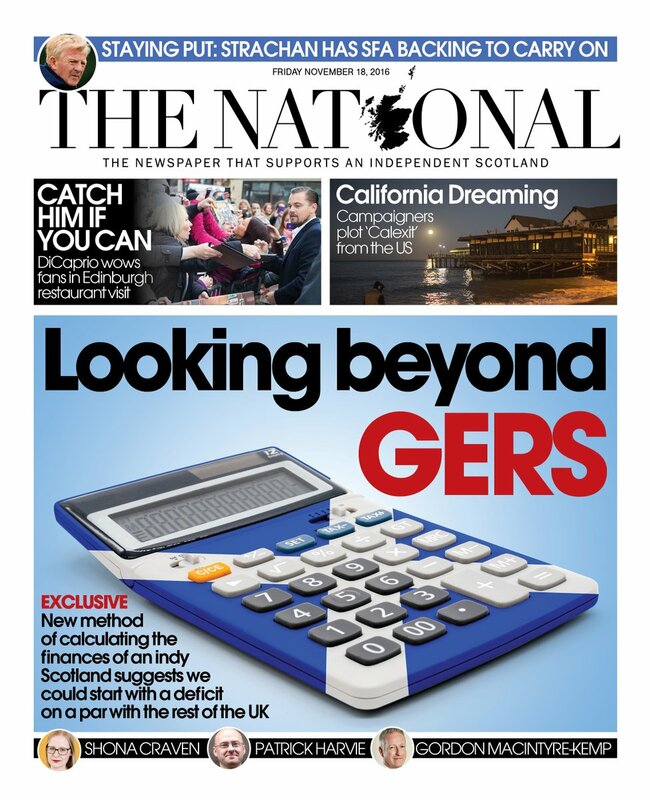 I'm not arguing in favour of independence however, I'm arguing for a much more sensible approach to Scotland's spending within the UK which I believe to be too high. To be clear though, criticism of the UK doesn't automatically mean someone is pro-independence. I wouldn't leave it to another day too far in the future. In a few years time when Brexit becomes a harsh economic reality, I think the idea Scotland will continue to be allowed preferential treatment with higher public spending will be open to a fairly rigorous challenge. We need to have our house in order when that day comes sooner than later. worldwide. Someone said they were/are Scotland's top 5 exporters. Much of this work, especially American related ITAR jobs depend on being in the UK. Independence would see all this move south of the border. Raytheon and Thales are in a similar position. exports and well paid salaries.